Press the button and strike a pose. The photo booth will take 4 pictures about 10 seconds apart. See the attendant for your photo. It’s that simple. ”Can you accommodate outdoor events? Definitely! 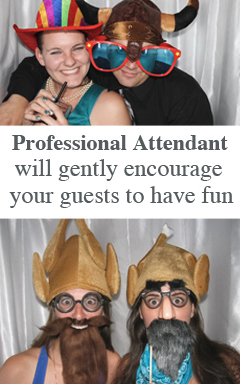 A professional photo booth attendant is there the entire duration of your event. They are there to make sure your guests have a good time and all the equipment operates smoothly. Yes, we will create a personalized photo template incorporating your name, date of event, logo on each strip for free. We will work with you prior to your event to create a custom photo strip for your event. We place all the photos from each event on our website gallery so your guests can download them for free. To ensure your guests know where to get electronic copies of their pictures it is best to have our website at the bottom of the photo strip. Our commercial grade dye sublimation printer will print the photo strips within 10 seconds for your guests’ immediate enjoyment. This will ensure the line of guests waiting to get in the booth will go quickly. Yes. After the event, you will receive a link to a downloadable zip file containing all of the photos taken at the event. We found this method much better than providing cd-roms or flash drives. In addition, all of the photos will be uploaded to our online gallery so your guests can download them for free as well. No, your guests can have as many sessions as they want during the duration of the package booked. They will receive a memorable keepsake of your event each time they use the booth. You have a choice between two – 2×6 inch strips with four pictures each or one 4×6 card with four photos per session. With our “Double Print” option, you can have two – 4×6 photos per session. Whether it’s a strip or a full 4×6, it will be personalized for you and your event. Yes! We have a prop box full of hats, glasses, mustaches on sticks, etc. available for an additional fee. If you prefer, you can always provide your own unique props if you wish. The booth is spacious and measures 36 inches wide by 80 inches long and stands 72 inches tall. The booth is wheel-chair accessible and can easily hold six people. All we require is access to one standard 110V outlet within 20 feet of the booth. Yes, we can. As long as there is level ground, available 110v power close by, plus adequate cover and protection from the elements. Yes, we will travel anywhere on Vancouver Island and the lower mainland. Travel fees and accommodation may apply depending on distance. Please contact us to inquire about your location and receive a quote. As a matter of fact, we highly encourage it! The quality of photo booths vary a great deal and we are very proud of ours. Our booths are professionally built and look great, plus the photo quality is one of the best in the business. We would be more than happy to arrange a private photo booth session in our office so you can experience the quality first hand. In order to book your event, we require a contract and a $400 Reservation fee to secure your date for the booth. The balance is due in full 7 days before your event. Yes! We gladly accept Visa, MasterCard and eTransfer.